A patellar dislocation occurs by a lateral shift of the patella, leaving the trochlea groove of the femoral condyle. This mostly occurs as a disruption of the medial patellofemoral ligament. The patellofemoral joint makes part of the knee joint. The articular surfaces consist of the patella and the trochlear surface of the femoral condyles. The articular cartilage on the medial facet is thicker than on the lateral facet, with the lateral facet bigger than the medial. It has an anterior projection on the lateral femoral condyle, lateral to the patellar groove. This prevents lateral dislocation of the patella. The patellofemoral articulation depends on the function of the quadriceps as it increases the angle of pull of the patellar tendon, improving the mechanical advantage of the quadriceps in knee extension. The medial patellofemoral ligament is the primary stabiliser (53-67%) against lateral displacement/dislocation of the patella. It is situated deep to the vastus lateralis muscle, ranging from the posterior aspect of the medial femoral condyle to the superiomedial part of the patella, vastus medialis and quadriceps tendon. The incidence for acute primary patellar dislocations are 2-3%. Patellar disolocations are often associated with athletes, and is most common in females in the second decade of life. Redislocation rates after conservative management is estimated betweeen 15 and 44%. Primary patellar dislocation is defined as traumatic disruption of the previously uninjured medial peripatellar structures. It often results from a non-contact injury to the knee. 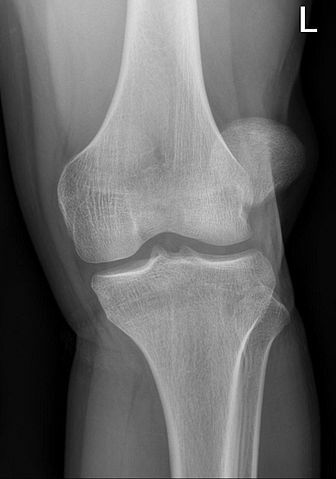 One of the common findings related to acute, primary, traumatic patellar dislocations is hemarthrosis of the knee, caused by rupture of the medial restraints of the patella. Medial swelling will also be prominent. Patellar dislocations often reduce spontaneously when the knee are extended. Conservative treatment is the most common treatment after primary patellar dislocation. Surgical stabilization significantly reduce the redislocation rate of primary traumatic patellar dislocation in the young adult population, but is associated with a higher risk of patellofemoral joint osteoarthritis. Initial post-operative management consists of pain management, physiotherapy and cryotherapy . Lateral release: Release of tight lateral retinaculum to allow more medial tracking of the patella. Used in conjunction with the lateral release and/or the medial patellofemoral ligament reconstruction. Primary acute patellofemoral dislocations should be managed conservatively with immobilization and rehabilitation, as the majority of these patients will do well without surgery. A MRI is necessary to assess for osteochondral lesions, as they are associated with a poor prognosis if not addressed. Surgical management would be considered in cases with recurrent dislocations, or when it is associated with patellofemoral symptoms. ↑ 1.0 1.1 1.2 1.3 1.4 1.5 1.6 1.7 Frobell R, Cooper R, Morris H, Arendt, H. Acute knee injuries. In: Brukner P, Bahr R, Blair S, Cook J, Crossley K, McConnell J, McCrory P, Noakes T, Khan K. Clinical Sports Medicine: 4th edition. Sydney: McGraw-Hill. p.626-683. ↑ 2.0 2.1 Matthijs O, Van Paridon-Edauw D, Winkel D. Hoofdstuk 2 knie. Manuele therapie van de perifere gewrichten. 1e uitgave. Houten. Bohn Stafleu Van Loghum bv. 2004. pp.220–235. ↑ Bijl GVD (Jr), De Graaf CG, De Ridder PA. In: Actief en passief bewegen in de gewrichten der extremiteiten. De tijdsstroom, 1975. p.126. ↑ 4.0 4.1 Egmond DL, Schuitemaker R. De knieregio. In: Mink AJF, Rer Veer HJ, Vorselaars JACTh. Extremiteiten manuele therapie in enge en ruime zin. 1e uitgave. Houten. Bohn Stafleu Van Loghum bv, 2006. p.559–628. ↑ 5.0 5.1 Atkin DM, Fithian DC, Marangi KS, Stone ML, Dobson BE, Mendelsohn C. Characteristics of patients with primary acute lateral patellar dislocation and their recovery within the first 6 months of injury. Am J Sports Med 2000;28:472–479. ↑ 6.0 6.1 Kirsch MD, Fitzgerald SW, Friedman H, Rogers LF. Transient lateral patellar dislocation: diagnosis with MR imaging. AJR Am J Roentgenol 1993;161:109–113. ↑ Ficat RP, Hungerford DS. Disorders of the patello-femoral joint. Williams & Wilkins, 1977. ↑ 8.0 8.1 Hughston JC, Walsh WM, Puddu G. Patellar subluxation and dislocation. WB Saunders Company, 1984. ↑ 9.0 9.1 9.2 9.3 9.4 9.5 9.6 9.7 9.8 Meeusen R. Praktijkgids knieletsels. Cursus. Vrije Universiteit Brussel, 2011. ↑ 10.0 10.1 10.2 10.3 Skinner HB, Barrack RL, Bedmar MS, Clarson GD. Sports medicine. In: Reinhardt S, Nogueira I, Boyle PJ. Current diagnosis en treatment in orthopedics. 2nd edition. McGraw-Hill: United States of America, 2000. p.125–175. ↑ 11.0 11.1 11.2 Beeton KS. The knee. Manual therapy masterclass: the peripheral joints. Churchill Livingstone. Elsevier, 2003. p.54–55. ↑ Tsai CH, Hsu CJ, Hung CH, Hsu HC. Primary traumatic patellar dislocation. Journal of orthopaedic surgery and research 2012;7(1):21. ↑ 13.0 13.1 Hohlweck J, Quack V, Arbab D, Spreckelsen C, Tingart M, Lüring C, Rath B. Diagnostic and therapeutic management of primary and recurrent patellar dislocations-analysis of a nationwide survey and the current literature. Zeitschrift für Orthopädie und Unfallchirurgie 201;151(4):380-8. ↑ Paxton EW, Fithian DC, Lou Stone M, Silva P. The reliability and validity of knee-specific and general health instruments in assessing acute patellar dislocation outcomes. The American journal of sports medicine 2003;31(4):487-92. ↑ Nikku R, Nietosvaara Y, Aalto K, Kallio PE. Operative treatment of primary patellar dislocation does not improve medium-term outcome: a 7-year follow-up report and risk analysis of 127 randomized patients. Acta orthopaedica 2005;76(5):699-704. ↑ Arendt EA, Fithian DC, Cohen E. Current concepts of lateral patella dislocation. Clinics in sports medicine 2002;21(3):499-519. ↑ Buchner M, Baudendistel B, Sabo D, Schmitt H. Acute traumatic primary patellar dislocation: long-term results comparing conservative and surgical treatment. Clinical Journal of Sport Medicine 2005;15(2):62-6. ↑ Van Gemert JP, de Vree LM, Hessels RA, Gaakeer MI. Patellar dislocation: cylinder cast, splint or brace? An evidence-based review of the literature. International journal of emergency medicine 2012;5(1):45. ↑ Castelyn P. Acute knee injuries, diagnostic and treatment managment proposals. Vub University press, 2001. p.42-43. ↑ Fithian DC, Paxton EW, Cohen AB. Indications in the treatment of patellar instability. The journal of knee surgery 2004;17(01):47-56. ↑ Koskinen SK, Rantanen JP, Nelimarkka OI, Kujala UM. Effect of Elmslie-Trillat and Roux-Goldthwait procedures on patellofemoral relationships and symptoms in patients with patellar dislocations. The American journal of knee surgery 1998;11(3):167-73. ↑ Stefancin JJ, Parker RD. First-time traumatic patellar dislocation: a systematic review. Clinical Orthopaedics and Related Research 2007;455:93-101. ↑ Weber AE, Nathani A, Dines JS, Allen AA, Shubin-Stein BE, Arendt EA, Bedi A. An algorithmic approach to the management of recurrent lateral patellar dislocation. JBJS 2016;98(5):417-27. ↑ Sillanpää PJ, Mattila VM, Mäenpää H, Kiuru M, Visuri T, Pihlajamäki H. Treatment with and without initial stabilizing surgery for primary traumatic patellar dislocation: a prospective randomized study. JBJS 2009;91(2):263-73. ↑ Smith TO, Song F, Donell ST, Hing CB. Operative versus non-operative management of patellar dislocation. A meta-analysis. Knee Surgery, Sports Traumatology, Arthroscopy 2011;19(6):988-98. ↑ Smith TO, Davies ., Chester R, Clark A, Donell ST. Clinical outcomes of rehabilitation for patients following lateral patellar dislocation: a systematic review. Physiotherapy, 2010;96(4):269-81. ↑ Smith TO, Chester R, Clark A, Donell ST, Stephenson R. A national survey of the physiotherapy management of patients following first-time patellar dislocation. Physiotherapy, 2011;97(4):327-38. ↑ Smith TO, Chester R, Cross J, Hunt N, Clark A, Donell ST. Rehabilitation following first-time patellar dislocation: a randomised controlled trial of purported vastus medialis obliquus muscle versus general quadriceps strengthening exercises. The Knee,2015;22(4):313-20.